Meal planning can be as simple or as complicated as you wish to make it. With todays busy lifestyles the simpler you make it, the better off you'll be. This means devising a plan and sticking to it. Do you remember your mother sitting down at the table and planning evening meals for the month? My mother used a calendar and wrote in each dinner for the month. That way the whole family knew what we would be having and could plan accordingly. There’s a lot that goes into meal planning – a lot that you may not have thought of. You need variety in the types of proteins, starches and vegetables from meal to meal in order to get all of your nutrients. You also need foods that will complement each other, providing great aroma and flavour. After all, what’s a meal if it’s not enjoyable? 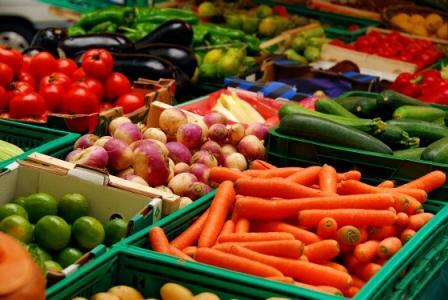 To start the meal planning process, first make a list of all the vegetables you like to eat, then a list of less desirable – but still willing to eat – vegetables. This will round out your vegetable choices for the month. 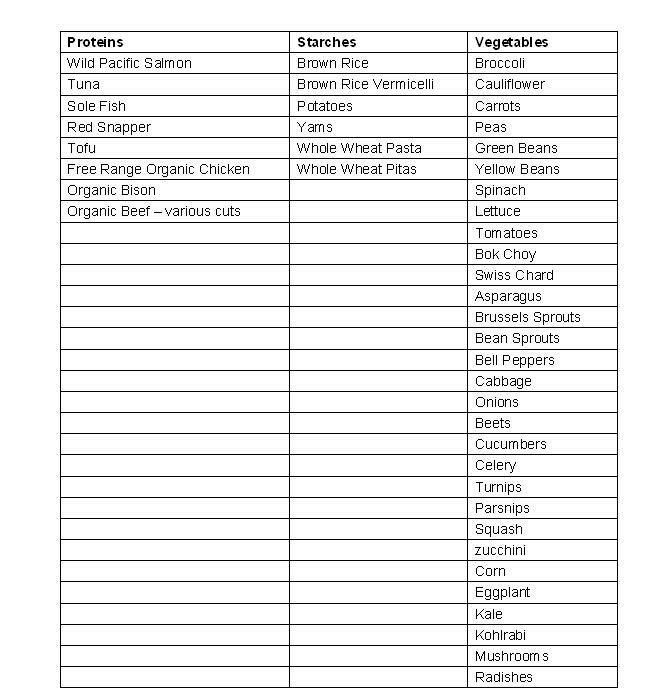 Next make a list of the types of starches you’re willing to eat. This will be a much shorter list than your vegetable list. Then it’s on to your protein sources. You can build your lists on an excel spreadsheet for easy sorting and pivoting. Once you’ve completed your lists, start pulling items to make your evening meals. Start with your protein list and build a dinner around it using a starch and two or three vegetables. Remember, variety is the key. Since there are nine protein sources in the food list above, you can make nine different meals during the month. The variety doesn’t stop here, though. From the nine choices, you can make a lot more meals – think soy baked chicken, sushi, baked salmon, chicken stir-fry, bison steaks, bison burgers, beef stir-fry, roast beef, stuffed chicken, red snapper with lemon sauce, grilled fish of your choice, beef sirloin, tofu chili, stuffed baked sole, broiled mahi-mahi, etc. There are various ways to prepare your starches, too. Brown rice is best steamed, rice vermicelli is warmed in a pot of boiling water, potatoes can be baked, boiled, mashed, roasted, or scalloped in a casserole, and the same goes for yams. Whole wheat pasta can be boiled and put in a casserole or salad, or eaten just boiled with a healthy tomato based sauce (homemade, of course). Whole wheat pitas can lay the foundation for healthy pita pizzas or can be used on a quick healthy sandwich or with a side of homemade soup. There are many ways to prepare vegetables, but the best bets are raw or steamed. Please keep that in mind and stay away from the microwave and the boiling pots of water – not good for the goodness of veggies. Another strategy for getting the most variety out of your vegetables is to buy frozen mixed bags and rotate your choice of mix each night. If the fancy mixes are a little too rich for your budget, try buying large bags of single veggies and make your own mix each night – just remember to use at least three different colours of veggies in your blend. Using the menu plan to fill out your shopping list will avoid the complications of missing ingredients when it comes time to prepare your meals. If you’re pressed for time and think that you can’t prepare meals for you and your family every evening, try preparing your meals in advance. When making one of your favourite dishes, prepare extra quantities (example: baked chicken) and freeze the extra pieces for use later in the month. If you make a large quantity of baked chicken you can easily freeze in individual portions and pull out later in the month for soy baked chicken or chicken stir-fry. The steps for meal planning can be transferred to planning your lunches as well. So go ahead, give it a try. It’s easy when you put your mind to it. Having a well thought out plan and a set menu will help you avoid the drive-thru window on your way home from work.